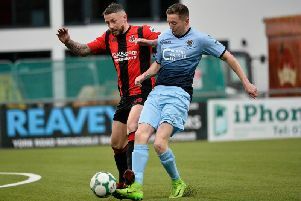 Striker Jordan Owens believes Crusaders are in the best possible shape ahead of a Danske Bank Premiership blockbuster against table-topping Glenavon at Seaview. Stephen Baxter’s title-holders are slowly but surely emerging from a horrible sequence of results which has left them playing catch-up, back in fifth place. Incredibly, they have been beaten on six occasions – two more than they suffered in the entire league campaign last season. But, significantly, they are still in the mix, especially as the top two - Linfield and Glenavon - have both surrendered points of late. The Crues warmed up for Saturday’s showdown by producing a stunning performance to defeat Glentoran 4-2 at the Oval in midweek, a victory that guaranteed their passage to the last four of the BetMcLean League Cup. “Glenavon are a good side with top-quality players,” said Owens. “Gary Hamilton has them well-drilled and playing well. “It’s another one of those big games and a good one to win, it’s what the Irish League is all about. “But we must focus on our team’s ambitions, we’ll go into the game with plenty of confidence following the win at the Oval. “We made six changes for that game, so it demonstrates the quality we have in the squad. “We conceded an early sloppy goal, but the lads showed great character to shrug it off. “It was a bit more like a Crusaders performance, it has been stop-start so far but it’s still early days. “From one to five or even six in the table, there is no team out of the title race. “I suppose it’s good for the fans, the teams at the bottom of the table have proved they are capable of beating the sides at the top. “You need a big squad for all the cup and shield games, especially if you have a few injuries and suspensions kicking in. Owens is expecting another crackerjack clash – Glenavon edged the corresponding fixture at Mourneview Park, battling back to win 3-2 courtesy of a wonder-strike from Josh Daniels. “That match was an absolute cracker,” recalls Owens. “We looked to be on our way to three points when we moved into a 2-1 lead. “Fair play to Glenavon, they showed great battling qualities to come back and level before Daniels scored a brilliant goal to win it. Glenavon manager Gary Hamilton claims his side must find a cutting edge. The Lurgan Blues bossed Saturday’s match with Warrenpoint Town but came away with a 1-1 draw, while the week before they lost 2-1 to Ballymena United after controlling the second half. Hamilton believes his side are playing well but stressed they need to start taking their chances. “I thought we played really well against Warrenpoint but we are not taking our chances and working the goalkeeper enough,” he said. “The most frustrating thing is that we can’t criticise the players’ performance, the same could be said for the display against Ballymena. “I also thought regarding the two games, we didn’t get what we deserved out of them. “We deserved a draw against Ballymena and I thought we deserved a win against Warrenpoint. “They (Crusaders) are starting to put a run together and it’s another tough game. “They will come strong again, of that there is no doubt.